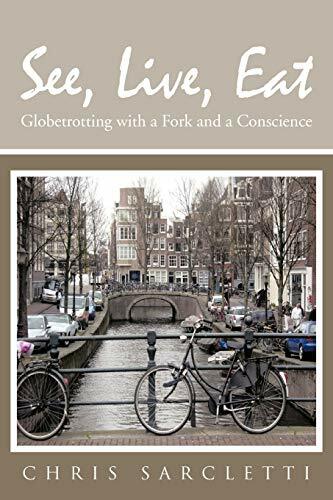 See, Live, Eat takes the reader on a fun, tasty and entertaining ride to many venues you may have thought of visiting and others you may have never considered. Whether it's sipping wine in Italy, paragliding in Argentina or visiting food markets in every city he sets foot in, Chris' stories are sure to entertain you and leave you with tidbits of new information. Chris enjoys his food and drink and does his best to sample the delicacies of each locale he visits whether it be bowls of soup in the markets of Mexico City, the culinary delights of New Orleans or seeing his lunch flop to its death before arriving on his plate in the form of sashimi in Seoul. Sit back and enjoy Mr. Sarcletti's adventures which stretch across the globe from the Turkish baths in Istanbul right back to your couch and the book in your hands. Chris Sarcletti is an accomplished traveler and food lover whose journeys have taken him across the globe from the markets in Vietnam to the remote Australian Outback and far in between. After 15 years of writing short stories about his travel adventures and dining experiences, Chris is publishing his first book. Chris has lived in Amsterdam and Toronto and currently resides in his hometown, Chicago, with his beautiful wife Ivy.